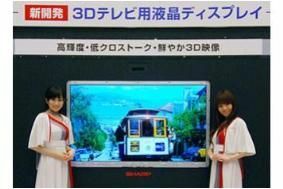 JAPAN: Sharp fires up the Quattron for a 3D TV push this Summer | What Hi-Fi? And executive managing officer Shigeaki Mizushima came out fighting about how the new Sharp 3D TVs will stack up agains those from rivals such as LG, Panasonic, Samsung and Sony. He said that the company's 3D LCD panels are brighter than existing 3D TVs and have solved the problem of images for the right and left eyes becoming mixed.